Many people are unaware of how inexpensive it can be to feed your family on the healthiest of whole foods, in a way that is nutritious and delicious - as well as highly creative! Dried beans and grains create a complete protein meal for as little as 28 cents a serving, but cooking these wholesome foods may seem daunting to many people who haven't done it before. These mysteries will be solved at the Nutritious/Delicious (and Cheap!) Cooking Seminar: How to Cook Beans & Grains, to be held near Potsdam, NY on Thursday, March 27th from 5:00 to 7:00 p.m.
Presenters Paula Youmell, RN of Hands On Health in Potsdam and Chelle Lindahl of the Local Living Venture make it fun and easy to eat these most delicious and healthy of foods. They will share many secrets of the healthy and happy kitchen with participants, as well as fun ways to make beans and grains a meal your family can look forward to -- every night of the week! Co-sponsoring the event is the Potsdam Food Coop at 24 Elm St., Potsdam, NY. They strive to provide a pleasant shopping experience and working environment, with an emphasis on education, shared information and developing a relationship with the community. The Co-op carries local, natural and healthful foods and is open to the public (no membership required) from 8 a.m to 7 p.m., seven days a week. A $15 donation level for workshop attendance is suggested for adults, $5 Students, some partial scholarships available upon request. Class size is limited, so participants must RSVP for the exact location near Potsdam, NY by contacting (315) 347-4223, or LocalLivingVenture@gmail.com, and leaving their name(s), emails, and phone numbers please. A listing of upcoming workshops and events can be found on the Workshop Schedule page at www.SustainableLivingProject.net. More Information on Hands On Health can be found at www.HandsOnHealthHH.com and the Potsdam Food Co-op at www.potsdamcoop.com. 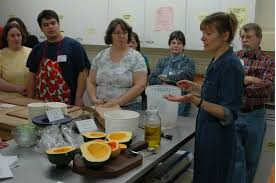 The Local Living Venture (LLV) (formerly Sustainable Living Project) is based in the St. Lawrence River Valley and coordinates near-weekly local workshops promoting traditional rural and simple living skills.